Here’s Clara Barton “Toots” Beddo Davis and Ernest Tubbs taken abt 1979, Kern Co., CA. Clara was the daughter of Dolly Mae Malicoat and BW Beddo, grand-daughter of Sarah Jane Barnett & Fanteroy M. Malicoat. Clara was born 5-13-1918 Garvin Co., OK. She died 7-18-1999 Hanford, Kings Co., CA, and is buried Shafter Cemetery Kern Co., CA. 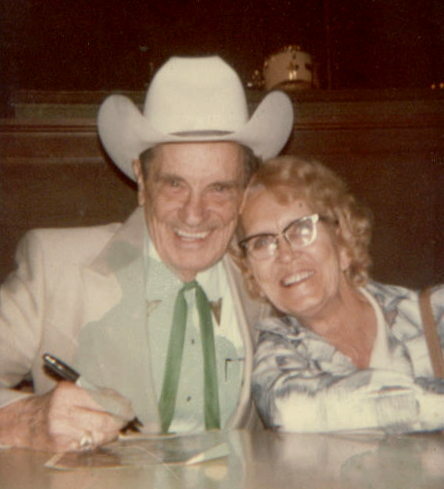 She was a great fan of Ernest Tubbs the western singer and went to see his road show and this picture was taken at that show. She always had this picture setting out anytime anyone went to visit her. Her youngest daughter Donna loaned this to me to scan and share. Toots was like a 2nd mother to me, on her death bed she kept calling for me and my mother. I would go visit her and she wouldn’t remember me. Her daughter Donna took the greatest care of Toots to her last breath.